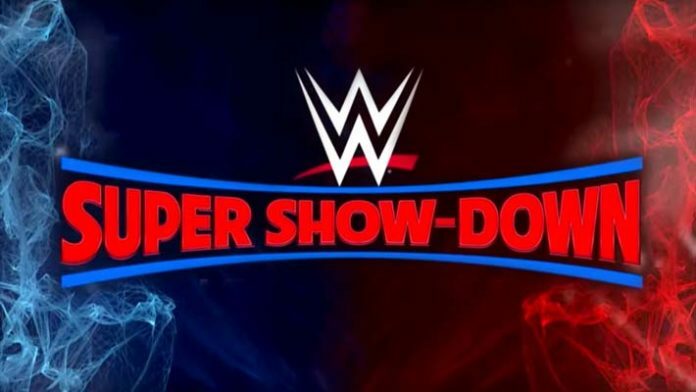 The WWE Super Show-Down took place at the Melbourne Cricket Ground (MCG) in Melbourne, Australia on October 6th, 2018. – The broadcast opens up with a shot of the MCG, and a video package looking at the feud between The Undertaker and Triple H. The video package moves on to the other feuds on the card, and then we go to the arena with a fireworks display. Michael Cole welcomes us to the show, with over 70,000 fans in the arena. – The New Day (c) vs. The Bar: The SmackDown Tag Titles are on the line in this one. Woods starts this one off strong against Cesaro, and Kofi quickly tags in to continue the offense. Kofi knocks Cesaro outside and goes for a suicide dive, but The Bar catches him. Sheamus drives Kofi in to the ring post, and Cesaro drops Woods at ringside. Back in the ring, Cesaro beats down Kofi and keeps him grounded with some submission attempts. Sheamus tags in and drops Kofi on the apron and hits the 10 Beats of the Baron, but he loses interest before he makes it to 10 and he tags in Cesaro. Kofi comes back with a jawbreaker and then looks to tag in Woods, but Sheamus tags in and drops Woods off the apron. Cesaro tags back in now for the double team, and then Sheamus hits a cheap shot on Kofi behind the ref’s back. Woods finally gets the tag and cleans house, then he hits a facebuster on Sheamus for a two count. Woods kicks Sheamus and looks for a DDT, but Sheamus fights him off and hits the Irish Curse backbreaker. Cesaro comes in for the double team on Woods for a two count. Cesaro swings Woods and then applies the Sharpshooter. Woods breaks free and trade pin attempts with Cesaro. Meanwhile at ringside, Sheamus and Kofi get into it, and Kofi drops him with a kick to the head. Back in the ring, Woods hits the backstabber on Sheamus, and then Kofi tags in and hits a double stomp off the top for the three count. – We go to a video package looking at the feud between Becky Lynch and Charlotte for the SmackDown Women’s Title. – Becky Lynch (c) vs. Charlotte: The crowd is behind Becky in this one as the crowd chants “Let’s go Becky” before they lock up. The opening bell sounds and Becky backs Charlotte into the corner early on. Becky starts working over Charlotte’s right leg, and then she chokes her up against the ropes. Becky looks to submit Charlotte with an arm lock, but Charlotte holds on. Charlotte fights up, and Becky backs her in to the corner again. Becky misses a kick, and Charlotte stomps her knee in and then starts hitting chops. Charlotte and Becky trade strikes until Charlotte catches her with a suplex. Charlotte goes up top for a moonsault, but Becky gets her knees up to block it. Becky goes up top now for a splash, but Charlotte rolls out of the way and then applies a Boston crab. They wrestle around the mat and Charlotte locks in the Figure Four. Becky reaches her Women’s Title belt and nails Charlotte with it for the disqualification. Becky loses, but keeps the Title. – Becky immediately makes her exit after the match, but Charlotte chases her down and drags her back to ringside. They fight on the floor until Becky hits the t-bone suplex into the fan barricade. Becky then hits a running knee to the face of Charlotte up against the barricade, and then she makes off with her Title belt. – Elias and Kevin Owens are in the ring now with the spotlight on them. Elias warms up on his guitar and says there is no place that loves him like Australia, and then he leads the crowd in a Walk With Elias chant. He introduces Owens, who says the Super Show-Down should have been in Canada. Elias goes to continue, but Lashley’s music hits and interrupts him. – Bobby Lashley & John Cena vs. Elias & Kevin Owens: Cole tells us that Lashley’s manager Lio Rush couldn’t make the trip. Lashley and Owens start this one off, but Owens fakes him out and tags in Elias before anything happens. Elias and Lashley lock up, and Lashley overpowers him and beats him down to the mat with strikes. Lashley dominates Elias and Owens in the opening moments, but they’re eventually able to double-team him and take him down. Elias nd Owens get frustrated with Lashley now, until Lashley misses a spear and he crashes down to the ringside floor. Back in the ring, Owens hits a frogsplash off the top for a two count. Lashley comes back with a spinebuster on Owens, and both men are down. Lashley finally gets the tag to Cena, and Elias tags in too. Cena cleans house and hits the Five Knuckle Shuffle. Cena hits the Attitude Adjustment, and then his new “sixth move of doom,” which appears to be a punch to the face. Cena covers for the three count. – Lashley and Cena celebrate in the ring together after the match, and then Cena gets on the mic to a mixed reaction from the crowd. Cena talks about WWE being his home, and never forgetting where he came from. Cena says his life is changing, and he never knows what the future holds. Cena says there’s no better feeling in the world than being in front of the fans, and he thanks the crowd for having him in Australia to perform. His music hits and Cena heads to the back. – Asuka & Naomi vs. The Iiconics: The Iiconics come out first with mics and talk about finally being home in Australia. Naomi and Peyton start this one off with a collar and elbow tie-up. Peyton drives Naomi into the corner, and then Billie tags in. Naomi dodges a shot and comes back with a kick. Asuka comes in for the double team. Asuka looks for a shoulder submission, but Peyton tags in and breaks it up. Naomi and Asuka send the Iiconics outside with dropkicks. Back in the ring, The Iiconics double team Asuka and drop her. Peyton works over Asuka and then tags in Billie for another double team. Naomi finally gets the tag and hits a kick to the head. Naomi follows up with a moonsault, but Billie breaks up the pin. The fight spills out to ringside with all four money now, which leads to The Iconics double-teaming Naomi with a kick to the head for the three count. – The Iiconics celebrate after the match and high-five fans on the way to the back. – We see a live shot of downtown Melbourne, and then go to a video package looking at the feud between Samoa Joe and WWE Champion AJ Styles. – AJ Styles (c) vs. Samoa Joe: This one is a No DQ, No Countout match. Before the bell, Joe and AJ brawl on the ramp. They finally get in the ring and the ref calls for the bell. Joe backs AJ into the corner early on and then they fight out to ringside. Joe throws AJ over the announce table, but AJ lands on his feet and they head back in the ring. Joe lays into AJ with kicks now and drops him. AJ hits a series of kicks, but Joe comes back with some stiff chops to the chest. More strikes from Joe before he kicks AJ through the ropes down to the ringside floor. Joe follows up with a dive on AJ, and then takes him back in the ring. AJ starts to fight back, until Joe drops him with a shoulder block, and then the challenger follows up with an enziguri. Joe hits a running back elbow for a two count. AJ fights back and moonsaults off the middle rope for a reverse DDT on Joe for a two count. Joe comes back with some more stiff shots and a version of a tombstone piledriver for a two count. Joe goes outside to grab a steel chair, but when he gets back in the ring with it, AJ dropkicks the chair into Joe’s face. AJ grabs the chair now and tees off on Joe, then kicks him in the corner. AJ unfolds the chair and leaps off of it towards Joe, but Joe catches AJ and suplexes him through the chair. Joe grabs a table and sets it up in the ring now, as AJ is shown is blood coming from his lip. Joe takes AJ in to the corner, but AJ breaks free and gets Joe up in the electric chair position, and AJ drops Joe through the table. Joe starts selling a knee injury after the table spot, and AJ immediately starts stomping on the bad knee. AJ looks for a Calf Crusher, but Joe avoids it and looks for the Coquina Clutch. AJ comes back with a kick, and then a springboard 450 splash on to Joe’s bad knee. They fight out to ringside and brawl near the fan barricade. Joe dumps AJ into the crowd, but AJ punchesh im away and then the Champion springboards off the fan barricade with a forearm shot on Joe. Back in the ring, Joe catches AJ in a sleeper, and then he suplexes AJ for a two count. Joe looks for the Muscle Buster, but AJ escapes. Joe looks for the Coquina Clutch, but AJ escapes again and locks in the Calf Crusher. Joe tries to reach for the ropes to break the hold, but as this is a No DQ match, that won’t help him. Joe taps out and AJ wins via submission. – AJ takes his WWE Title belt as Joe sells his knee on the mat. – The Riott Squad vs. Ronda Rousey & The Bella Twins: Ruby gets the jump on Nikki and beats her down off the opening bell. Nikki fights back and tags in Brie for the double team. Ruby kicks Brie down and then tags in Liv who continues the offense on Brie. They do a spot where Brie tries to grab Liv by the tongue, but she appears to miss. Sarah Logan tags in and immediately hits a knee to the face of Brie. Sarah and Liv trade tags and double team Brie now, keeping her away from her team’s corner. Ruby tags in and keeps Brie grounded with a headlock. Nikki finally gets the tag and starts dropping the members of he Riott Squad. They overpower Nikki, but then Ronda finally gets the tag. Ronda throws down everyone who comes near her, and it’s down to Ronda and Sarah Logan. Ronda punches Logan in the corner and then hits a fireman’s carry. Ruby and Liv run in, but the Bella Twins take them out and they brawl at ringside. Meanwhile in the ring, Ronda goes for an arm bar, but Liv Morgan breaks it up. They go to double team Ronda, but Ronda fights them both off. Ronda appears to apply an armbar to both Liv and Sarah at the same time, and they tap out. – Ronda and the Bella Twins celebrate in the ring after the match. – Cedric Alexander (c) vs. Buddy Murphy: This one is for the Cruiserweight Title. Murphy hits a knee strike immediately and rolls up Cedric for a two count. Cedric rolls outside and Murphy hits a big suicide dive on him. Back in the ring, Buddy follows up with a series of kicks and stomps. Cedric comes back with a kick of his own, and now they fight in to the corner. Cedric hits a Michinoku Drive off the turnbuckle for a two count. Cedric hits a facebuster and then Buddy rolls outside, where Cedric follows up with a suicide dive. Back in the ring, Cedric continues the offense on Murphy. Cedric looks for the Lumbar Check, but Buddy fights him off with a kick. They fight to the top turnbuckle again, but Cedric wastes some time getting distracted by the crowd. Cedric looks for a superplex, but Murphy fights it off. Buddy looks for a sunset flip powerbomb, but Cedric blocks it. Buddy kicks Cedric in the head and then does a sit-out powerbomb for a two count. Buddy follows up with a knee to the face, but Cedric fights back and hits a facebuster for a two count. Cedric follows up with the Lumbar Check, but Murphy kicks out and Cedric can’t believe it. Cedric springboards off the top rope for a shot, but Murphy blocks it with a kick. Murphy follows up with the pumphandle driver for the three count. – Buddy celebrates with the Cruiserweight Title after the match and basks in the hometown pop. – The Shield vs. Braun Strowman, Dolph Ziggler and Drew McIntyre: The two sides brawl before the bell and they fight at ringside near the announcers’ table. The Shield looks to powerbomb Braun through the table, but Ziggler and McIntyre break it up, and they beat down The Shield at ringside. They finally get back in the ring and the opening bell sounds. Ziggler, Drew and Braun trade tags and take turns beating on Seth Rollins to start things off. Rollins takes down Drew with a sling blade, but then Braun tags in and knocks Reigns and Ambrose off the apron to prevent the tag. Braun shoulder tackles Seth down, then he picks Rollins up but wastes some time yelling at the crowd. Braun hits a spear in the corner on Rollins, then a right hand to the face before he tags in Ziggler. Ziggler looks for a Fameasser, but Rollins catches him and powerbombs him into the corner. Drew tags in and looks for a powerbomb, but Seth hurricanranas him down. Braun tags in and shoulder tackles Rollins down. Braun hits a splash in the corner and throws Seth down to the mat. Strowman climbs up to the top rope and goes flying for a splash off the top, but Seth rolls out of the way and Braun crashes down by himself. Ziggler and Ambrose get the tags, and Ambrose hits a series of strikes and then a fallaway slam. Ambrose knocks Drew off the apron, and then Dolph hits a shot on him. Ambrose grabs him and looks for the Dirty Deeds, but Ziggler escapes. Ambrose blocks a superkick attempt and then hits a facebuster for a two count. Ambrose looks for a flying elbow, but Ziggler dodges him. They run the ropes and collide in the middle, and both men are down. Reigns and Drew get the tags, and Reigns comes in strong with punches. Reigns backs Drew in to the corner and hits a series of clotheslines. Reigns clotheslines Drew to the outside, then Reigns runs around the ring with the drive-by kick. Back in the ring, Reigns hits a DDT for a two count. Reigns gets distracted by Ziggler on the apron, which leads to Drew hitting a shot on Reigns. Reigns goes for a Superman punch, but Drew dodges it, and Reigns accidentally Superman punches Ambrose off the apron. Dolph and Braun come in now to help Drew beat down Reigns. Seth comes flying off the top with a shot on Dolph, but Braun and Drew are still in there to drop him. The legal men are Reigns and Drew. Reigns and Rollins get to their feet, while Drew, Dolph and Braun surround the ring. Ambrose gets back in the ring now and dropkicks Braun off the apron while Reigns and Rollins battle with Drew and Dolph. Ambrose gets back in the ring to help The Shield beat down Drew. The Shield looks for the triple powerbomb, but Strowman comes in and spears them all down at once. Braun throws Reigns and Rollins out to ringside, and that leaves just Ambrose inside. Braun runs around the ring and nails Reigns against the barricade, and then he hits a running shoulder tackle on Rollins on the floor. Meanwhile in the ring, Ziggler hits the Zig Zag on Ambrose for a two count. Braun shouts instructions from the floor as Ziggler throws Ambrose out to ringside. Braun runs around the ring towards Ambrose, but Reigns intercepts the shot and spears Braun through the fan barricade, Back in the ring, Dolph and Drew look to double team Ambrose, but Rollins breaks it up. Rollins takes out Drew, and Dolph takes out Rollins. Dolph turns around and walks right in to the Dirty Deeds from Ambrose for the three count. – The Shield celebrates at ringside and do their fist bump pose. – The Miz vs. Daniel Bryan: The Miz starts off strong with a series of knee to the mid-section of Bryan. They trade kicks, and then Miz hits a running knee strike for a two count. Miz argues with the ref about the count, and then Bryan rolls up Miz in a small package for the three count after a very short match. – Bryan celebrates at ringside. Bryan has now earned a shot at AJ Styles’ WWE Title. The Miz throws a tantrum at ringside. – Michael Cole promotes the Crown Jewel event in Saudi Arabia. The broadcast team tells us that AJ Styles vs. Daniel Bryan has been booked for Crown Jewel. – Triple H vs. The Undertaker: This one is a No DQ match. Shawn Michaels is at ringside for this one. The Undertaker starts off strong, but Triple H turns things around. The fight spills out to ringside where Taker decks Shawn Michaels, and a table gets set up at ringside. Kane gets involved, and Triple H ends up putting Kane through the table with a flying elbow off the apron. Undertaker comes back with a Tombstone and pins, but Triple H gets the shoulder up at 2. The Undertaker gets frustrated now and he drops the ref with a right hand. Taker grabs a steel chair and he kicks the downed ref out of the ring. Taker puts the boots to Triple H while he’s down, and then he taunts Shawn Michaels at ringside. Taker smashes the steel chair over the back of Triple H on the mat. Shawn Michaels looks concerned at ringside as Undertaker waits for Triple H to get up to his knees. Taker bashes Triple H with the chair again. Taker unfolds the chair around Triple H’s head and goes to stomp on it, but Shawn Michaels gets up on the apron to distract him. Taker punches Shawn off the apron, but Triple H capitalizes on the distraction with a spinebuster. Another referee comes out to the ring now. Triple H looks for a Pedigree on Taker, and he hits it. Triple H covers but Taker gets the shoulder up at 2. Triple H now puts the chair over Undertaker’s head while he’s down, and then he hits a knee drop from the middle rope. Triple H covers again, but this time Kane pulls the ref out of the ring. Taker puts Triple H in the Hell’s Gate submission, but there’s no ref, and Taker eventually releases the hold. Both men are down and slow to get to their feet. Taker goes to grab the slegehammer, but Shawn Michaels grabs it and steps in the ring. Kane gets in and goes for a chokeslam, but Shawn kicks him below the belt. Taker throws Shawn outside as Kane goes down too. Taker picks up the sledgehammer now, but then drops it and Triple H charges. Triple H looks for a pedigree, but Taker back body drops him away. Taker hits a chokeslam, then he calls for the Tombstone. Taker picks up Triple H, but then Shawn Michael hits a superkick from behind. Michaels goes for another kick, but this time Taker catches it. It looks like Michaels is in trouble, but then Triple H nails Taker with the sledgehammer. Michaels hits another Superkick on Taker, and then Triple H hits the Pedigree for the three count. – Triple H and Michaels embrace in the ring after the match. Triple H extends his hand to the Undertaker to help him to his feet. Triple H and Undertaker hug in the ring, and he shakes hands with Kane too. They all raise their hands as the fireworks go off above the arena. After the fireworks, Taker and Kane attack HHH and HBK out of nowhere. Kane clotheslines hawn down, and Taker hits the Tombstone on Triple H. Shawn gets up, and they throw him out to ringside. Taker chokeslam’s Shawn through the announce table. The Brothers of Destruction head to the back as Undertaker’s music plays. The Super Show-Down goes off the air with Triple H and Shawn Michaels laying at ringside, and Kand and The Undertaker walking up the ramp.